Hello everyone, and welcome to my new blog! This will be the first of many entries posted here. The purpose of these entries is to enable me and my team to keep you updated on the most recent research and activities being done in our labs. I would like my blog and new website (www.doctorqmd.com) to be an online community where patients and their families can come for the latest information and resources available in my field. Your positivity, perseverance and fortitude keep me going and give me hope that we can make a difference in this fight against brain cancer. Together, we are paving the way for a brighter tomorrow! The quest for a cure is the driving force behind the research being done at my lab. Research is our passion and we are always trying to advance the field. I’ve been working tirelessly with my team of researchers to find a cure. We are grateful to have the opportunity to share our latest research with you! There are many exciting projects you can explore on my website that are taking place right now in my lab. 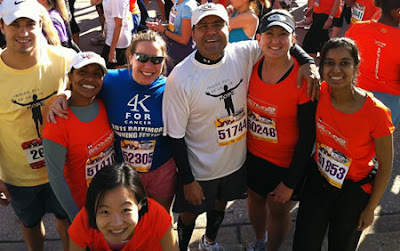 As you peruse the new web site, please take a moment to look at the Baltimore Running Festival event. I’m very excited to announce that I will be running the half-marathon! I ask that you consider running with us on October 15th to help us raise money in our effort to fight brain cancer. To join our team, please visit http://www.active.com/donate/qquest. This is yet another way to join the fight for a cure. To all of you who have joined our team in this fight, I thank you. You have inspired me to train my hardest so that I am in tip top shape by race day. My children have been watching me train and are very excited to join me. Though they are not quite ready to run a half-marathon, but they can’t wait to be there cheering us on throughout the run. If you decide to join us, please be sure to contact us and let us know you are running!